Click the button in the upper right corner of the Color Swatches panel and select â€œClear Swatchesâ€ from the popup menu. As shown in Figure 19, we can quickly clear all the color samples. After we have customized our own color samples, if we want to continue using these color samples in the future, we will need to save these samples. At this point we only need to select â€œSave Swatchesâ€ in the pop-up menu shown in Figure 19, then select a path and name the color table file, where the color table file has the extension .act. 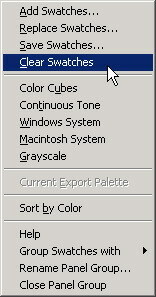 Finally click "Save" to save our own color table file. After using Fireworks for a long time, we constantly add, delete and replace color samples according to our own preferences. Over time, the color arrangement on the color swatch panel is confusing, so we need to sort the color samples. Sorting color samples is actually very simple. Just select â€œSort by Colorâ€ from the pop-up menu shown in Figure 19, and we can sort the existing samples by color, as shown in Figure 20.